You may not think that tap handles would be designed by IDEO. But in the early 2000s Boston Beer Company approached IDEO to create an innovative tap handle for their flagship beer Samuel Adams Lager. The interesting part about tap handles is, that people enter a bar and within less than 5 seconds they make a decision based on the quick glance along the stanchion, on which a variety of handles is fighting for attention. Our approach was to start with a very modern appearance, made out of quality materials, like anodized aluminum and injection modeled plastic. The top is a molded, translucent polymer that captures the light from the bar. With its changing light and depth it catches people’s attention. This tap handle, which comes in a Seasonal version with interchangeable labels as well, was distributed over the entire US and could be seen in bars, restaurants, airports, etc for several years. In 2009 Boston Beer Company came back to IDEO to develop another tap handle. This time the company asked for something more traditional. Something that would communicate craft. IDEO looked into materials that are being used in the brewing process. In addition an iconic spiral design was developed that would stand out between other tap handles. The location of spiral would lead bar tenders to hold the tap handle closer to the stanchion, leading to less broken handles and reducing the amount that needs to be replaced. The combination of materials, and the unique design, have made this product one of the most successful tap handles out there. 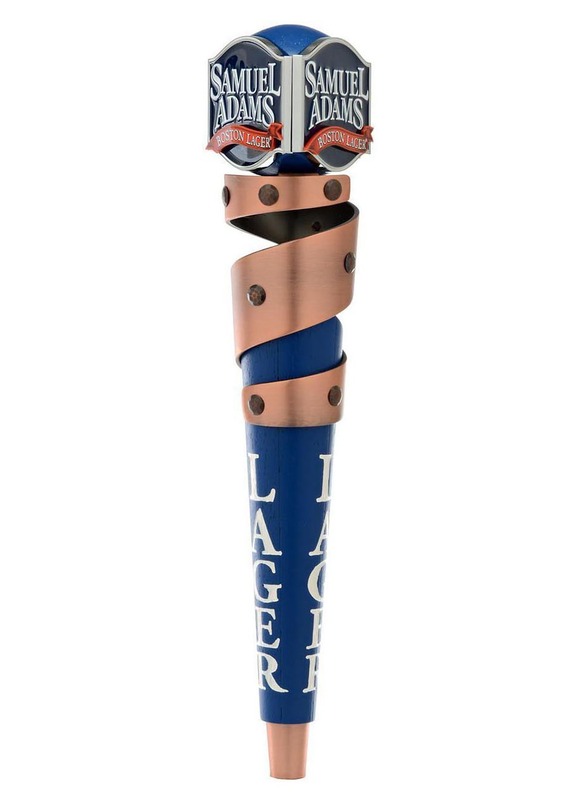 It has been in the market since 2010 and is still the main tap handle for Samuel Adams Lager. It comes in a Seasonal version as well.